Fifteen year old Clary Fray has a relatively normal if somewhat sheltered life with her mother, Jocelyn, in New York City. She has a faithful best friend in Simon, even if it sometimes seems that he would like to be more than friends. Then one night, she and Simon sneak out to an all ages club called Pandemonium, where Clary witnesses an inexplicable murder. Inexplicable because the body disappears, and it seems only she can see the killers. The three warriors call themselves Shadowhunters, and claim their victim was a demon. They are also very interested in how it is that Clary, supposedly a mundane, can see them at all. 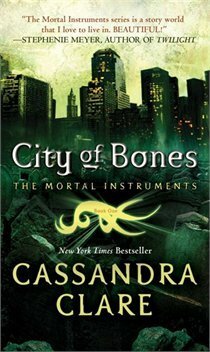 On the heels of this encounter, Clary’s mother disappears, and she herself is attacked by a demon in her own home. It appears that Jocelyn may have been hiding something from Clary, or possibly hiding Clary from someone. Now Clary finds herself pulled into the world her mother deliberately left behind, with only the mysterious and self-assured Jace as her guide. 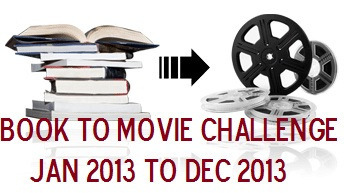 In film and book alike, the dialogue is a bit awkward, often verging on cheesy. 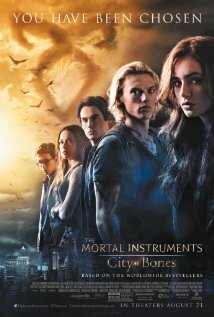 Cassandra Clare has a campy sense of humour and largely manages to carry it off well, but the film seems to be on the fence about whether it should embrace its own cheesiness or aim for the dramatic. The audience in the theatre seemed uncertain about whether they were laughing with the film or at it in many cases, the greenhouse scene in particular. Fortunately, Jamie Campbell Bower and Robert Sheehan were able to pull off Clare’s amazing snarky banter between Jace and Simon, and in general embodied these two characters, and the tension between them, incredibly well. Clare’s book is on the long side (600+ pages in paperback), featuring a number of side plots and scrapes that were streamlined out of the film. Overall, this simplification was badly needed—I suspect any film version of the flying vampire motorcycle scene would have been unbearably bad—but in some cases, the film goes too far. The second encounter with Madame Dorothea, for example, makes absolutely no sense without the explanation provided in the book. The dialogue that explains the situation in the book feels a bit forced and expositional, but at least the situation makes sense. Jocelyn’s decision to give Madame Dorothea the tarot cards is not logical otherwise, and a couple lines of dialogue are all it would have taken to correct the confusion. The book and film are also alike in that they are consistently inconsistent, funny one moment, and melodramatic the next; action-packed and fast paced, and then suddenly plodding, weighed down by exposition and explanation. Both have fun and very enjoyable moments, but are less satisfying when taken as a whole. Great! Thanks for a informative overview.